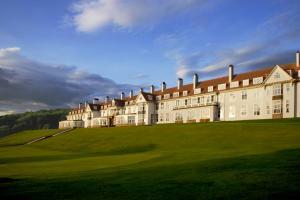 Choose from 29 hotels and guest houses in Ayrshire. Shown below a just a selection of the hotels available. To search within an area please use the menu on the right. With an enviable reputation for ambience, cuisine and friendliness, this family-run hotel is ideally situated in the heart of historic Ayrshire, within easy reach of the beach. The hotel is perfectly situated for golf lovers as Ayrshire is home to some of the best courses in the world, from the Open Championship courses at Turnberry and Royal Troon, to the prestigious Prestwick and Gailes courses to a range of superb municipal facilities, many regarded as the best in Scotland. For a moment of relaxation, North Beach's bar provides peaceful surroundings, with views of the 18th hole of Prestwick Old Course. Here you can sample one of the 50 malt whiskies on offer, or enjoy freshly ground coffee, a bar snack or pastries. 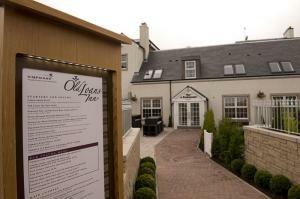 The Kilkerran is a 10-minute drive from Prestwick Airport. Your room rate includes breakfast. 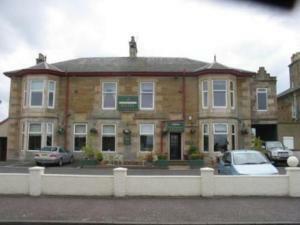 The guest house is close to Newton-on-Ayr railway station and the X77 bus route to Prestwick Airport and Glasgow. Late arrivals and early departures are catered for. A warm welcome awaits you. This friendly, family-run hotel in Ayr town centre offers a warm Scottish welcome and light, spacious rooms with free Wi-Fi. The relaxed Elms Court Hotel is just 5 minutes from the train station and a 10-minute drive or train journey from Prestwick Airport. Many excellent golf courses are a short drive away. The bar and restaurant serve good food, and the hotel can host special parties and conferences. 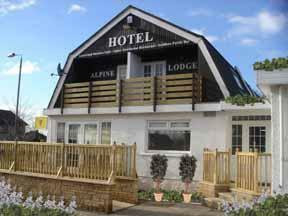 On the quayside, looking out over the waterfront, the hotel offers comfortable, great-value rooms and free parking, just off the A8 and less than 650 metres from Cartsdyke Railway Station. The Premier Inn Greenock has a convenient waterside location. The A8/M8 runs east into Glasgow and on to Edinburgh. The town's many train stations offer direct services to Glasgow Central Railway Station. The hotel has a 24-hour reception desk and some rooms can take 2 adults and up to 2 children (under 16 years). The 2 children also get a free full breakfast when accompanied by an adult eating a full breakfast. An all-you-can-eat buffet breakfast is available each morning and includes the expected cooked items such as scrambled, fried, poached or boiled eggs, and pork or vegetarian sausages. There is also a wide continental selection. The on-site Table Table restaurant offers a fresh new twist on eating out. 5 minutes from Ayr's town centre, in the heart of Burns Country, this small family-run hotel offers a warm welcome, with tasty full Scottish breakfasts, en suite rooms and free Wi-Fi and parking. Flloyds is just 15 minutes from Glasgow Prestwick Airport and about 45 minutes from both Glasgow International Airport and Glasgow's town centre. Ayr Racecourse is only 2 miles (3.2 km) away. Flloyds offers great golfing holidays for individuals, couples, families and male, female or mixed groups. All of the en suite rooms have TVs, central heating and tea/coffee. Small and family run, Flloyds prides itself on offering a friendly welcome and a warm home-from-home atmosphere. 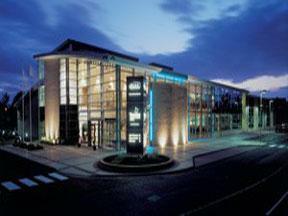 The hotel is one of Ayrshire's best venues for live music and offers regular entertainment every weekend. The Fenwick Hotel offers good access to Glasgow and Prestwick International Airport, providing the perfect base from which to explore Ayrshire's beautiful coastline and numerous golf courses. 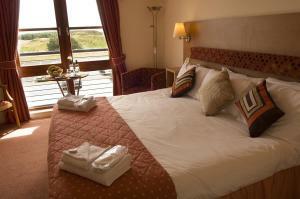 The Fenwick Hotel offers spacious, comfortably furnished rooms, with en suite facilities and a TV. The award-winning hotel restaurant serves modern Scottish cuisine, including fresh West Coast seafood and Ayrshire game, in light and stylish surroundings. There is also a choice of 2 bars; the lively Country Pub and the Cocktail Lounge with its cosy log fire. Free parking is available for guests. This cosy guest house is conveniently situated just 300 metres from Irvine town centre, close to bars, restaurants and the town's popular shopping centre. St Andrews Guest House was renovated in 2007 and now features a whisky themed dining room with whisky barrels and literature on the 'water of life'. Golf and whisky packages are a speciality of the guest house, with over 50 golf courses within an hour's drive and 3 distilleries within one hour 30 minutes drive away. The guest house is just a short drive away from Glasgow Prestwick Airport and a free courtesy bus is available for Ryanair passengers (minimum 2 night stay. This service is offered from 08:00 to 22:00, 7 days a week). All of the rooms at St Andrews Guest House are comfortable and are well equipped with en suite bathrooms, colour TV, DVD player and complimentary DVD library. 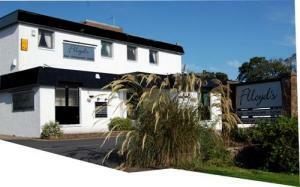 Situated close to the town centre, the guest house offers excellent value for money. 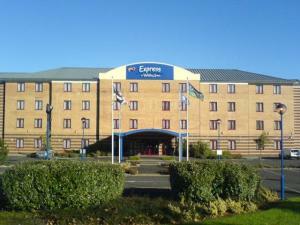 The Express By Holiday Inn Glasgow Greenock is a modern and comfortable hotel, perfect for business or leisure. 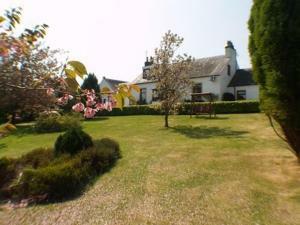 Located close to Glasgow and Loch Lomond, this popular property is a great choice for a good night's sleep! 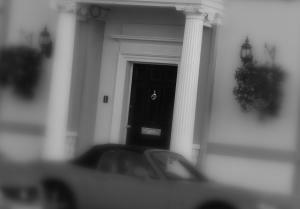 Situated in the town centre, this hotel is the ideal choice for leisure breaks or business needs. 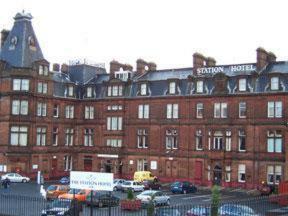 The Swallow Station Hotel is the oldest and most famous hotel in Ayr, adjacent to Burns Statue Square, overlooking the railway station, through which thousands of Victorian tourists used to flock from industrial Glasgow to the wonderful beaches here. With newly refurbished comfortable bedrooms and a direct link to Scotland's most exciting city, this landmark hotel is the ideal base for a business or leisure trip into South West Scotland. Ayrshire is Scotland's gateway to Ireland, offering direct Sea Cat ferry services from Troon to Belfast, Stena Line ferry services from Stranraer to Belfast and flights from Prestwick International Airport to Dublin. With the country's top racecourse, host of the Scottish Grand National, and some of the greatest golf courses in Scotland on your doorstep, you can be assured of a thriving atmosphere at this comfortable hotel. 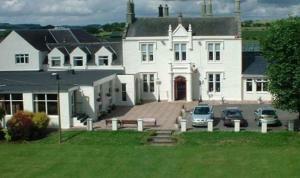 Moorpark House is a grand and welcoming country-house hotel in secluded grounds a 30-minute drive from Glasgow. 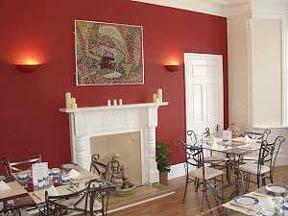 It was built in 1860 and underwent a multi-million pound refurbishment. The renovated hotel has beautiful grounds and attractive interiors. Some special features include a hand-painted ceiling in the drawing room; a stairway with stained-glass windows; an imposing entrance hall; and a dining room with conservatory. All the luxurious rooms overlook the croquet lawn and have free internet access, satellite TV, a DVD player and a CD player. Each room is individually designed. Surrounded by beaches, only 5 miles (8 km) from Ayr's town centre and only 2 miles (3.2 km) from Glasgow Prestwick Airport, the hotel offers comfortable, great-value rooms and free parking. 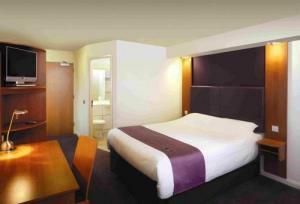 The Premier Inn Ayr is located at the junction of the A77 and A78 roads. The shops, bars and restaurants of Ayr town centre are within easy reach and Troon's ferry port is only a 10-minute drive away. Glasgow is just 35 minutes' away by road. The hotel has a 24-hour reception desk and some rooms can take 2 adults and up to 2 children (under 16 years). The 2 children also get a free full breakfast when accompanied by an adult eating a full breakfast. The all-you-can-eat breakfast buffet includes the expected cooked items such as scrambled, fried, poached or boiled eggs, and pork or vegetarian sausages. There is also a wide continental selection. The on-site Brewers Fayre restaurant offers traditional, great-value pub favourites in a family-friendly environment. This is a beautifully refurbished Victorian property situated on the same road as Prestwick International Airport. New to Active Hotels. The Beechwood consists of two adjoined houses, one in which your hosts live and the other is completely for guest use. This gives you the independence of a hotel at sensible guest house prices. 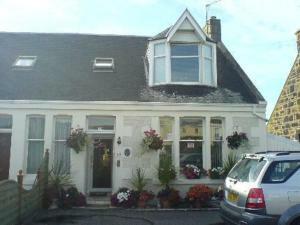 Situated in an ideal position for those passing through Prestwick International Airport. Early breakfasts can be arranged for early departures (please mention at the time of booking). Late check ins can also be arranged if noted at the time of booking. The Beechwood is surrounded by many golf courses, making us a golfer's haven. 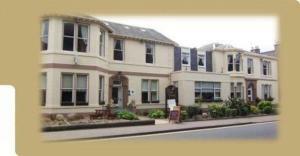 We are also in walking distance to the award winning town centre of Ayr, which boast many shops, bars and restaurants.